For more informal reviews: click me. Also, click me for more insight from Publisher's Weekly. "But her mother said, "Cuando la causa es justa, los demás te siguen." "When you fight for justice, others will follow." To begin, I had actually looked up the Chicano Civil Rights Movement. I learned it was an extension of the Mexican-American Civil Rights Movement from the 1960s. I ended up finding a lot of information on the Mendez vs. Westminster case from the 1946. The case ruled for racial desegregation for students in the state of California. At the time, Mexican-Americans were being discriminated against for their skin and hair type. The case was centered around the Mendez family fighting for their children's rights to get the same education at White students. 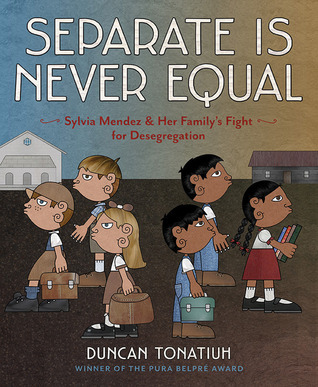 The picture book is told from Sylvia Mendez's perspective and how she felt when she and her brothers were denied admittance to Westminster because "those were the rules." Sylvia and the Mendez family knew it was because of their Mexican origins. This was very similar to how Leon from "Leon's Story" knew that there was something inherently wrong with being treated like a second-class citizen based solely on skin color. Though Sylvia and her brothers spoke perfect English, they were denied and forced to go to a "Mexican School". This resulted in Sylvia and her family fighting for educational justice for students of all races. It was a long and difficult journey that ultimately came out in favor of the just cause. But, their victory didn't mean peace. Sylvia had to learn to keep her head up high and with pride and create relationships with others who may not have agreed with her court case ruling. The book is a simplistic yet powerful interpretation of the history of the case and how a family fighting for justice created a movement that ultimately ended with desegregation for all students in California. The racial injustices we had talked about in element three come to a point in element four where students are empowered to fight for educational, racial, religious, gender, and other justices. This picture book is a beautiful embodiment of the fruits of diligence is meant to give students hope to continue through the fight for a just cause. Though there are people against you, there are so many people for you. Before students understand what to fight for, by now, I am hoping to have gone over certain injustices from element three. As an ongoing activity, I'd like for my students to ponder, from the injustices we've learned about something they are personally passionate about. Once they've thought about it, I'd like to come up with a think tank, where the students would anonymously write what they were passionate about and we'd shuffle them into the think tank. Every day from then, for a little bit of time during the day, we'd go through the think tank, one comment at a time. For that little bit of time every day, we would openly talk about that injustice and how we as a class could come together and become activists. Where have we seen the injustice? Have we experienced it? How would you stand up against the injustice? I'd like for this to be an ongoing discussion for the rest of the year. By the end of the year, similar to the picketing video, I'd like for the students and myself to come up with a movement ourselves, once we've started to go through the 20 or so injustices we've come up with. We'd be able to harness and work on one or two of them that the class has collectively become passionate about. We'd name the movement and we'd enact and enable it as we plan it to prove that activists can come from anywhere. We can be adults marching for justice, or children who can envision a better future.